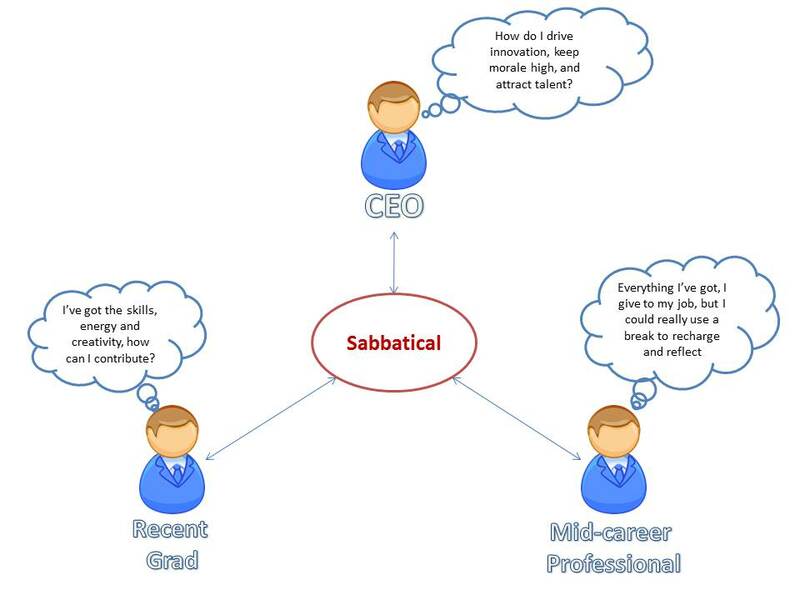 Could a sabbatical boost your career and create more jobs? Imagine if sabbaticals were no longer the exclusive purview of university professor wanting a year off to write a book, but were available to professionals across companies large and small, who were able to absorb the cost of taking time off with the expectation of a job waiting for them on their return. Such a scheme would benefit of course those employees in need of a break, but, with thoughtful design, could be a huge boon to participating companies and new graduates struggling to launch their careers. Many mid-career professionals hit a wall, when one’s level of responsibilities or intellectual stimulation no longer matches his/her level of ambition or competence. There are several paths out of the predicament: some shift their focus internally; some quit; others simply continue to show up at the office without energy or passion, performing well below their potential and often demoralizing their colleagues. Meanwhile, almost every CEO is clamoring for more innovation, higher employee creativity and better adaptability in rapidly-changing competitive environment. Focus groups are created to better understand the millennial demographic or consultants brought in to help cultivate an entrepreneurial culture. Firms are increasingly aware how difficult it is to motivate one’s employees, defeat resistance to change among company veterans, and maintain the edge in the global competition for talent. The final piece of the sabbatical puzzle can be illustrated by Alba Méndez, a 24-year-old with a master’s degree in sociology, who can bring creativity and energy to a new role, is able to relate to millennials much better than most silver-haired executives, and is ready to drive change or at the very least not stand its way. Despite all that, Ms. Mendez is struggling to kick off her professional career and is seeking a job at a supermarket to make ends meet. Given the restrictive and complex nature of European labour laws, HR departments are not very keen on candidates without a proven record of success. We can begin to untie this Gordian Knot, by matching these three groups together, swapping a seasoned professional in need of a rejuvenating break for an unemployed high-potential – the first takes a yearlong sabbatical, the second becomes a “sabbatical cover”. Companies retain yet refresh their talent pools, allow existing employees to recover from burnout or acquire new credentials and simultaneously bring in new blood who will drive innovation without much risk. It’s squarely in both public and private interests to embrace this policy. Nearly five million young people are unemployed in Europe. Intensifying global competition and technological disruptions are putting evermore pressures on blue-chips and other corporate incumbents alike. And lastly, the top talent is growing increasingly restive with employers – no longer satisfied with just a job and a paycheck. Why than are companies apprehensive about sabbaticals and what is the role of governments? Guided by outdated paradigms, HR directors and executive boards might not see the upside, but clearly recognize the risks of letting people go knowing that they may or may not come back, and worse yet having to budget for the return. Making a commitment to reintegrate an employee after a year or two away, seems like a step too far if such decisions are framed around employee’s interest. But once it becomes a matter of the enlightened company’s self-interest, the paradigm might shift. Governments, in parallel, can design policies incentivizing companies to try this out. And better yet, create special schemes rewarding companies for bringing in new graduates as “sabbatical covers” and thus addressing the youth unemployment issue. There are synergies all around, not to mention the secondary effects on families where fathers take a year off to spend it with the kids. The nature of work is changing, as are the needs of businesses and the way societies are organized. The recent buzz about Sweden switching to a 6-hour workday had resonated strongly. The job creation of tomorrow is not about the reallocation of a finite amount of factory jobs between China and Germany. We can get to a million jobs figure easily if just around 1% of educated professionals in 28 EU member states decide to take a sabbatical this year. We will not be simply addressing a thorny issue of unemployment, we’ll be qualitatively advancing our thinking about personal and professional fulfillment, and we’ll be better off for it.